MMC SGA PresidentKrista Schmidt was among 80 FIU students who spent spring break exploring all the nation’s capital has to offer and advocating for FIU initiatives. 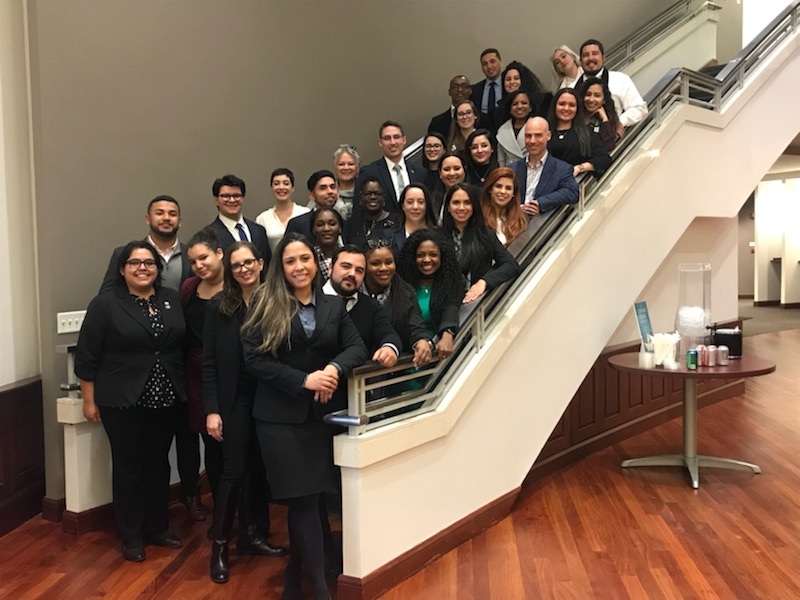 Eighty students from five different FIU cohorts headed to Washington, D.C., March 12-16, for an educational experience that focused on national challenges, advocacy and career paths. 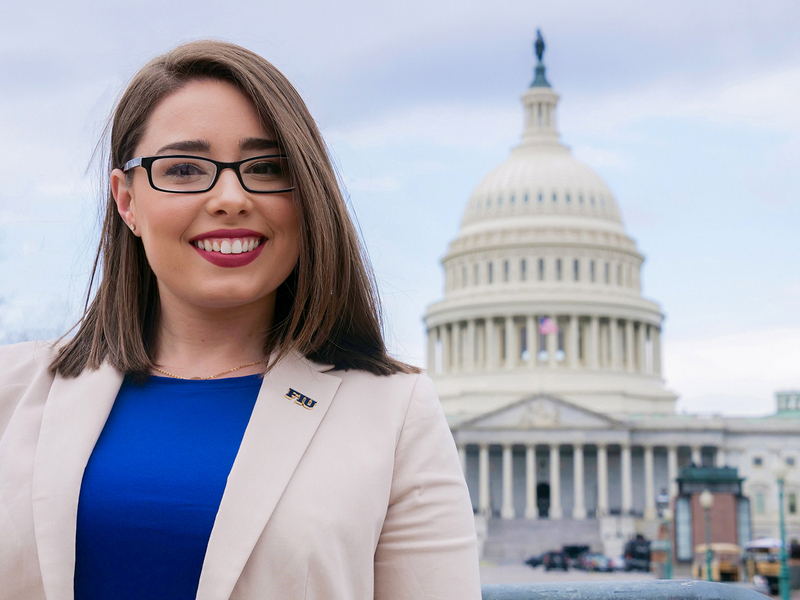 Dubbed March Madness, this is the first spring break that FIU in D.C. hosts, offering students extraordinary access to federal agencies and Capitol Hill. The Steven J. Green School of International and Public Affairs’ Jack Gordon Institute sent 36 Intelligence Fellows to D.C. The group visited eight intelligence agencies and met with recruiters to learn more about job opportunities. Organizations on their itinerary included the Defense Intelligence Agency, Central Intelligence Agency, National Geospatial-Intelligence Agency, Federal Bureau of Investigation, National Security Agency and House Permanent Select Committee on Intelligence. Robb Kurz instructing students before the WarGaming simulations. 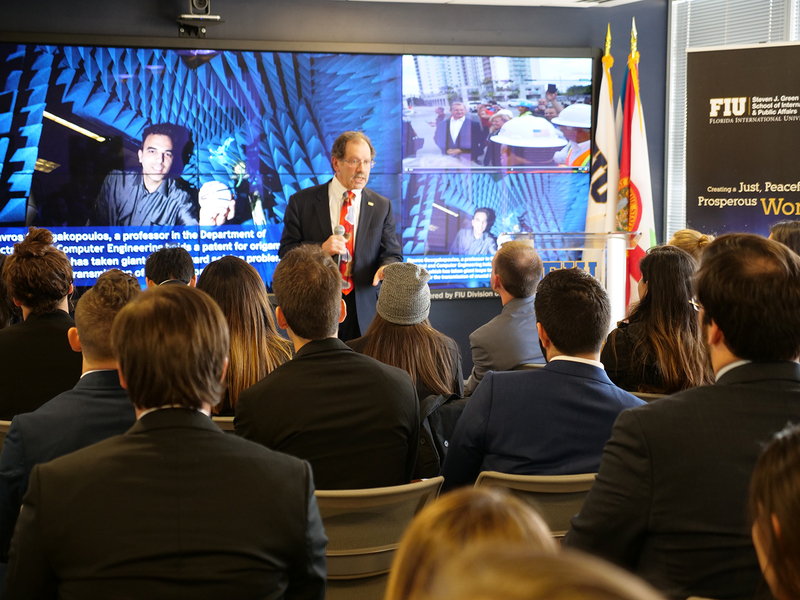 Students also heard from guest speaker Robb Kurz, former Congressional Foreign Affairs staffer who orchestrated a ‘Wargaming Event’ in which FIU students engaged in real-world stimulations of international challenges. They received dossiers on specific threats and as a group collaborated to present viable solutions. Students Krista Schmidt, Jose Sirven and Alyssa Pepio with Fostering Panther Pride success coach Ana Ramos met Representative Carlos Curbelo to advance their initiative. Students representing A Light in the Closet, a program focused on LGBTQA initiatives, and Fostering Panther Pride, a program offering opportunities to students who were previously in foster care or homeless, traveled to D.C. with Modesto A. Maidique Campus SGA President Krista Schmidt and Vice President Jose Sirven. The group met with Congressman Carlos Curbelo, where they advocated for federal support of state legislation that promotes the fiscal and personal advancement of children in foster care. The students visited the Children’s Bureau at the Department of Health & Human Services to share their story with top administrators within Health & Human Services. They advocated for enhancement of the Fostering Panther Pride program at FIU and discussed options to incentivize other institutions to create similar services. Other student groups in D.C. for spring break included 20 students from the College of Law who met with Acting Associate Attorney General of the Department of Justice Jesse Panuccio and U.S. Securities and Exchange Commission Chairman Jay Clayton. They also visited the Supreme Court, Federal Trade Commission, Office of the Legislative Counsel and Google. After a long day of advocacy, the law students had an opportunity to meet with FIU Law alumnus and General Counsel for Gallup International William B. Kruse. They attended an event at the Great Hall Lobby at Gallup for Kruse’s book, The Corporate Counsel Survival Guide. In addition, they were treated to a one-on-one discussion and participated in a Q&A session with Kruse. 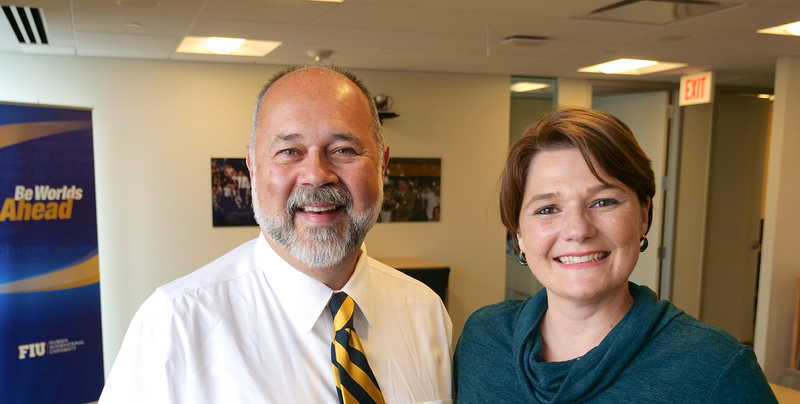 Deans from the College of Communication, Architecture + The Arts (CARTA), Honors College and College of Law also were in town to support student visits. Two student cohorts from the Honors College accompanied Interim Dean Juan Carlos Espinosa, while Acting Dean of College of Law Tawia Ansah met with various student groups during his week-long trip. Dean of CARTA Brian Schriner visited Capitol Hill and discussed potential internships for communications students with the South Florida delegation. “It is a privilege to support our students in Washington. Nothing comes before opportunities for them. This makes us different, it makes us special, it makes us family,” said Espinosa. While students where exposed to all the opportunities in D.C., faculty continued to advocate for FIU research. Frank Mora, director of the Kimberly Green Latin American and Caribbean Center, and his colleagues at the University of Florida, met with Florida Congressional Delegation staff to discuss the importance of Title VI funding. Title VI supports Fulbright-Hays grant and fellowship programs that strengthen foreign language instruction, area/international studies teaching, and research. Stavros V. Georgakopoulos, professor of the Department of Electrical and Computer Engineering, visited with officials at the National Science Foundation, Army Research Lab, Air Force Office of Scientific Research, and the Department of Defense’s Small Business Office to advance FIU’s research on the reconfigurable antenna platform. Georgakopoulos also spoke to students about his cutting-edge research on the antennas, which have multiple applications, including military, tactical, satellites, airborne, and more. Dr. Carlos Espinal of the Robert Stempel College of Public Health & Social Work’s Global Health Consortium visited the Pan American Health Organization, as well as private pharmaceutical funders in preparation for this May’s global health conference to be held in Miami, Florida. Private support of the Global Health Consortium was made possible by alumni advocates working in health care policy that sought to connect corporations with university research. Sara DuCuennois, Associate Executive Director at FIU Foundation, Inc.
Amanda Santa Cruz, Donor Events Officer II at FIU Foundation, Inc.
Christy Martinez, Assistant Director, Foundation Board Relations at FIU Foundation, Inc.
To learn more about the university’s presence in the nation’s capital, visit FIU in D.C.’s website.